God's guidance the Inuit way. God erects Inukshuks for his children. 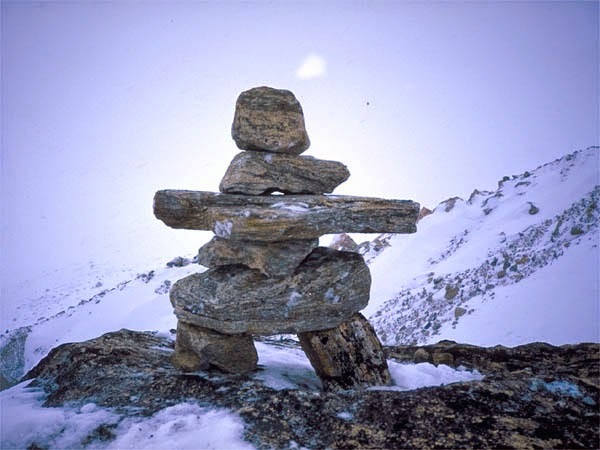 The mysterious stone figures known as inuksuit can be found throughout the circumpolar world. Inukshuk, the plural of which is inuksuit, means "in the likeness of a human" in the Inuit language. They are monuments made of unworked stones that are used by the Inuit for communication and survival. The traditional meaning of the inukshuk is "you are on the right path." These sculptural forms are among the oldest and most important objects placed by humans upon the vast Arctic landscape and have become a familiar symbol of the Inuit and of their homeland. Inuit tradition forbids the destruction of inuksuit. An inukshuk is often venerated as symbolizing an ancestor who knew how to survive on the land in the traditional way. A familiar inukshuk is a welcome sight to a traveler on a featureless and forbidding landscape. We need divine guidance. Human plans are not good substitutes for divine guidance: we need to spot God’s inukshuks.